For a few years now, I've been using iTerm 2 and tmux. But only recently did I find out about a pretty important feature of iTerm: tmux integration. I found out because I was getting tired of tmux as a window manager and started looking for alternatives. The tmux integration basically means that you use iTerm 2 as you normally would for window management, except it uses tmux on the backend for multiplexing. You can download iTerm 2 from the website. tmux must be installed on whichever machine you plan to use it. Using iTerm 2, log into the machine you want to work with. This can be your local machine or a remote server over ssh. 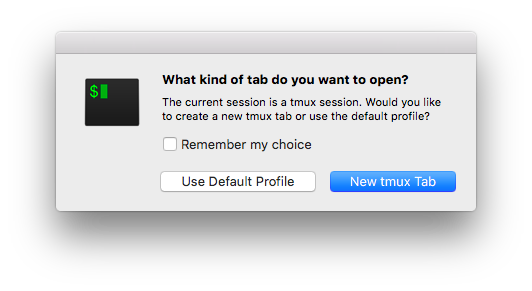 Start a new tmux session using the -CC option. You will see a message saying tmux mode started with a Command Menu. You can choose whether you want to do this using the same profile or not. If you choose to use the same profile, iTerm will use tmux to create virtual windows. When you're done working and you're ready to detach you can simply close the tab or window. 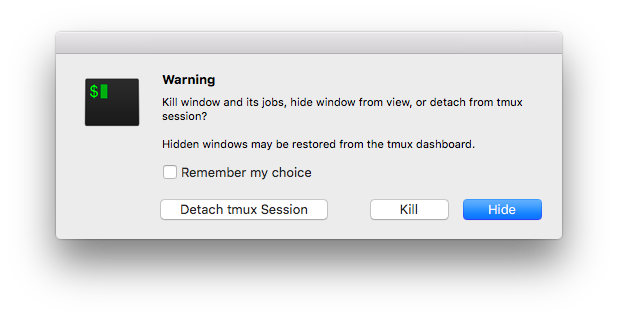 iTerm will ask you whether you want to detach tmux or kill the windows. Clicking Detach tmux Session will cleanly detach and allow you to re-attach in the future. Learn the basics of awk with these simple examples. If you need more background information on the awk command, check out the guide What is awk?. Learn how to generate ssh keys on Linux/Unix systems. Sometimes I type or paste a lot of text on the command line and there is a small error right in the middle. Sometimes I've run a command but I need to run it again but replace a word multiple times.